For the time being, the automated provisioning of Azure Active Directory Applications only targets B2E kind of applications. It is not tackling B2C nor B2B (multi-tenant) apps. In a nutshell, this task was created to automatically provision Azure Active Directory Applications that allow business applications to authorize users and APIs using OAuth2/OpenID. Instead of doing this job manually for each and every business application, it is possible to automate most of these steps as part of the release life cycle. However, in order to remain compliant with most enterprise policies, the provisioned apps remain under the control of the identity and access management team that has to provide the Admin Consent to the deployed apps. 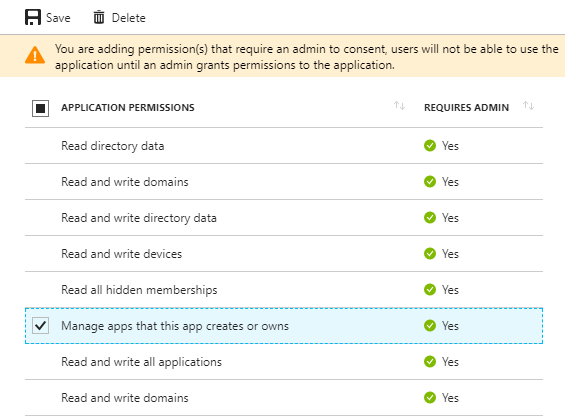 Admin Consent is mandatory for all apps that require application permissions while it is optional in some other cases. However, non-consented apps will prompt users as of the first use, which can be annoying with internal employees as internally developed applications should be considered trusted by default. Since the consent part is beyond the scope of this task, feel free to handle it your own way. This documentation assumes that you have no Visual Studio Team Services endpoint configured yet. If you already have some and if you know Visual Studio Team Services, feel free to adjust your existing endpoints with the information provided below. Creation of the Azure Active Directory Application. Once you have enabled this extension into your Visual Studio Team Services account, you have to create an Azure Active Directory Application that will be used by the task in order to authenticate against your directory. You must grant it the following application permission: over your Azure Active Directory tenant. Make sure to create an application secret and to copy its value for later use. This will give the task the right of registering applications while not being able to interfere with other apps. Depending on the level of trust between application teams and operation teams within your organization, one may also grant the Read and Write directory data permission, which is required to use the User & Group assignment. Unfortunately, this cannot be restricted to your apps only. Therefore, if the identity & access management team wants to remain fully in control and has a low risk appetite, you should not grant this permission. The counterpart is that the second task (user and group assignment) will not work without this. The task will use the ClientCredentials flow to connect to Azure Active Directory. You may consider the registration of this App somehow similar to a regular VSTS Service Endpoint. Note that if you already have endpoints registered, you could simply reuse one of the existing Azure Active Directory Applications and give it the above permission. The task is will be using the Azure Active Directory Application created in the previous step while connecting to Azure Active Directory and will also be using the RBAC "Key Vault Contributor Role" (more on this below): In the select textbox, you should enter the application identifier of the app you created. 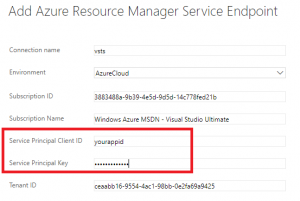 When using Access Tokens together with Azure Active Directory V2 PowerShell cmdlets, an account name must be provided to the Connect-AzureAD cmdlet. Therefore, the easiest is to create a service account that is simply a member of the directory. Now that the Azure Active Directory Application has all the required permissions, it is time to register it inside of Visual Studio Team Services by creating a new Service Endpoint. Click on New Service Endpoint ==> Azure Resource Manager ==> at the bottom, click on the link labelled Use the full version of the endpoint dialog and fullfill the form with your own App Id & Secret retrieved from the previous step You should endup with something similar to this: You can click on the link labelled Verify connection to see if everything is setup correctly. If you do not create this Variable Group, you'll have to define these values at task level. You should use the Hosted 2017 agent. In case you use on-premises agent, I recommend creating a separate Agent Phase using the Hosted 2017 agent. If you do so, feel free to tick the option labelled "Skip download of artifacts". Some of the task parameters directly come from the Variable Group created earlier, which means that you must bind this Variable Group to your release definition. They are pre-configured with variable names. You do not need to change anything if you created the Variable Group as explained earlier. ⋅⋅⋅The task shipps with multiple templates that are intended to cover typical topologies. For instance, when having a mobile app connecting to an Azure-hosted API, your work will only consist in providing the right reply & identifer URLs. Since the input field exposed by the task is merely a textbox, you should use a true JSON editor to configure that part of the task. Note that every template is usable "as is" but of course, you should adapt them to your own situation (replyUrls, identifiers etc.). If you are not too sure about how to configure the task, you can test each of the template against a sandbox subscription and look the results in the Azure Portal. 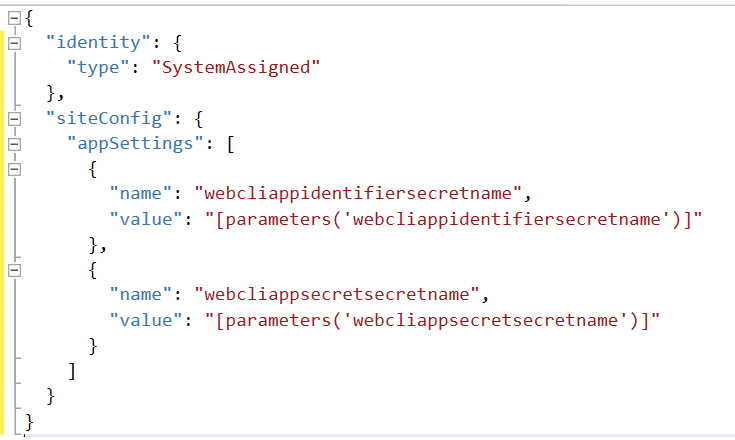 Here is an example of a custom API that exposes custom application and delegate permissions, and its related web client. The identifier of the API is reused in the RequiredResourceAccess attribute of the web client. Indeed, the webclient wants to request the MyDelegatePermission scope as well as the role1 application permission. The attribute KeyVaultAppIdName holds the name of the Key Vault secret that stores the idenfifier of the provisioned Azure Active Directory Application. 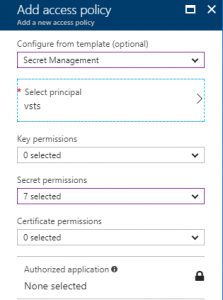 The attribute KeyVaultAppSecretName holds the name of the Key Vault secret that stores the secret (if any) of the provisioned Azure Active Directory Application. The attribute MSIEnabledRelatedWebAppName lets the task grant the SPN of the related web application, a GET access policy to the Vault storing the application identifier and secret. a42657d6-7f20-40e3-b6f0-cee03008a62a Directory.AccessAsUser.All Allows the app to have the same access to information in your work or school directory as you do. 5778995a-e1bf-45b8-affa-663a9f3f4d04 Directory.Read.All Allows the app to read data in your company or school directory, such as other users, groups and apps. 78c8a3c8-a07e-4b9e-af1b-b5ccab50a175 Directory.ReadWrite.All Allows the app to read and write data in your company or school directory, such as other users, groups. Does not allow user or group deletion on your behalf. 970d6fa6-214a-4a9b-8513-08fad511e2fd Group.ReadWrite.All Allows the app to create groups on your behalf and read all group properties and memberships. Additionally, this allows the app to update group properties and memberships for groups you own. 6234d376-f627-4f0f-90e0-dff25c5211a3 Group.Read.All Allows the app to read all group properties and memberships on your behalf. c582532d-9d9e-43bd-a97c-2667a28ce295 User.Read.All Allows the app to read the full set of profile properties of all users in your company or school, on your behalf. Additionally, this allows the app to read the profiles of your reports and manager. cba73afc-7f69-4d86-8450-4978e04ecd1a User.ReadBasic.All Allows the app to read a basic set of profile properties of other users in your company or school, on your behalf. Includes display name, first and last name, photo, and email address. Additionally, this allows the app to read basic info about your reports and manager. 311a71cc-e848-46a1-bdf8-97ff7156d8e6 User.Read Allows you to sign in to the app with your work account and let the app read your profile. It also allows the app to read basic company information. 2d05a661-f651-4d57-a595-489c91eda336 Member.Read.Hidden Allows the app to read the memberships of hidden groups or administrative units on your behalf, for those hidden groups or administrative units that you have access to. 5778995a-e1bf-45b8-affa-663a9f3f4d04 Directory.Read.All Allows the app to read data in your company or school directory, such as users, groups, and apps. abefe9df-d5a9-41c6-a60b-27b38eac3efb Domain.ReadWrite.All Allows the app to read and write all domain properties without a signed in user. Also allows the app to add, verify and remove domains. 78c8a3c8-a07e-4b9e-af1b-b5ccab50a175 Directory.ReadWrite.All Allows the app to read and write data in your company or school directory, such as users, and groups. Does not allow user or group deletion. 1138cb37-bd11-4084-a2b7-9f71582aeddb Device.ReadWrite.All Allows the app to read and write all device properties without a signed in user. Does not allow device creation, device deletion or update of device alternative security identifiers. 9728c0c4-a06b-4e0e-8d1b-3d694e8ec207 Member.Read.Hidden Allows the app to read the memberships of hidden groups and administrative units without a signed-in user. 824c81eb-e3f8-4ee6-8f6d-de7f50d565b7 Application.ReadWrite.OwnedBy Allows the app to create other applications, and fully manage those applications (read, update, update application secrets and delete), without a signed-in user. It cannot update any apps that it is not an owner of. 1cda74f2-2616-4834-b122-5cb1b07f8a59 Application.ReadWrite.All Allows the app to create, read, update and delete applications and service principals without a signed-in user. Does not allow management of consent grants. aaff0dfd-0295-48b6-a5cc-9f465bc87928 Domain.ReadWrite.All Allows the app to read and write all domain properties without a signed in user. Also allows the app to add, verify and remove domains. f534bf13-55d4-45a9-8f3c-c92fe64d6131 Financials.ReadWrite.All Allows the app to read and write financials data on your behalf. ff91d191-45a0-43fd-b837-bd682c4a0b0f EAS.AccessAsUser.All Allows the app full access to your mailboxes on your behalf. 7f36b48e-542f-4d3b-9bcb-8406f0ab9fdb Bookings.Manage.All Allows an app to read, write and manage bookings appointments, businesses, customers, services, and staff on your behalf. 948eb538-f19d-4ec5-9ccc-f059e1ea4c72 Bookings.ReadWrite.All Allows an app to read and write Bookings appointments, businesses, customers, services, and staff on your behalf. Does not allow create, delete and publish of booking businesses. 02a5a114-36a6-46ff-a102-954d89d9ab02 BookingsAppointment.ReadWrite.All Allows an app to read and write bookings appointments and customers, and additionally allows read businesses information, services, and staff on your behalf. 33b1df99-4b29-4548-9339-7a7b83eaeebc Bookings.Read.All Allows an app to read bookings appointments, businesses, customers, services, and staff on your behalf. 43781733-b5a7-4d1b-98f4-e8edff23e1a9 IdentityProvider.Read.All Allows the app to read your organization’s identity (authentication) providers’ properties on your behalf. f13ce604-1677-429f-90bd-8a10b9f01325 IdentityProvider.ReadWrite.All Allows the app to read and write your organization’s identity (authentication) providers’ properties on your behalf. 5a54b8b3-347c-476d-8f8e-42d5c7424d29 Sites.FullControl.All Allow the application to have full control of all site collections on your behalf. 65e50fdc-43b7-4915-933e-e8138f11f40a Sites.Manage.All Allow the application to create or delete document libraries and lists in all site collections on your behalf. ba47897c-39ec-4d83-8086-ee8256fa737d People.Read Allows the app to read a list of people in the order that's most relevant to you. This includes your local contacts, your contacts from social networking, people listed in your organization's directory, and people from recent communications. 2219042f-cab5-40cc-b0d2-16b1540b4c5f Tasks.ReadWrite Allows the app to create, read, update and delete tasks assigned to you and plans (and tasks in them) shared with or owned by you. f6a3db3e-f7e8-4ed2-a414-557c8c9830be Member.Read.Hidden Allows the app to read the memberships of hidden groups or administrative units on your behalf, for those hidden groups or adminstrative units that you have access to. 8f6a01e7-0391-4ee5-aa22-a3af122cef27 IdentityRiskEvent.Read.All Allows the app to read identity risk event information for all users in your organization on behalf of the signed-in user. 7427e0e9-2fba-42fe-b0c0-848c9e6a8182 offline_access Allows the app to see and update your data, even when you are not currently using the app. 37f7f235-527c-4136-accd-4a02d197296e openid Allows you to sign in to the app with your work or school account and allows the app to read your basic profile information. 863451e7-0667-486c-a5d6-d135439485f0 Files.ReadWrite.All Allows the app to read, create, update and delete all files that you can access. df85f4d6-205c-4ac5-a5ea-6bf408dba283 Files.Read.All Allows the app to read all files you can access. 5c28f0bf-8a70-41f1-8ab2-9032436ddb65 Files.ReadWrite Allows the app to read, create, update, and delete your files. 10465720-29dd-4523-a11a-6a75c743c9d9 Files.Read Allows the app to read your files. d56682ec-c09e-4743-aaf4-1a3aac4caa21 Contacts.ReadWrite Allows the app to read, update, create and delete contacts in your contact folders. ff74d97f-43af-4b68-9f2a-b77ee6968c5d Contacts.Read Allows the app to read contacts in your contact folders. 1ec239c2-d7c9-4623-a91a-a9775856bb36 Calendars.ReadWrite Allows the app to read, update, create and delete events in your calendars. 465a38f9-76ea-45b9-9f34-9e8b0d4b0b42 Calendars.Read Allows the app to read events in your calendars. e383f46e-2787-4529-855e-0e479a3ffac0 Mail.Send Allows the app to send mail as you. 024d486e-b451-40bb-833d-3e66d98c5c73 Mail.ReadWrite Allows the app to read, update, create and delete email in your mailbox. Does not include permission to send mail. 570282fd-fa5c-430d-a7fd-fc8dc98a9dca Mail.Read Allows the app to read email in your mailbox. 0e263e50-5827-48a4-b97c-d940288653c7 Directory.AccessAsUser.All Allows the app to have the same access to information in your work or school directory as you do. c5366453-9fb0-48a5-a156-24f0c49a4b84 Directory.ReadWrite.All Allows the app to read and write data in your organization's directory, such as other users, groups. It does not allow the app to delete users or groups, or reset user passwords. 06da0dbc-49e2-44d2-8312-53f166ab848a Directory.Read.All Allows the app to read data in your organization's directory. 4e46008b-f24c-477d-8fff-7bb4ec7aafe0 Group.ReadWrite.All Allows the app to create groups and read all group properties and memberships on your behalf. Additionally allows the app to manage your groups and to update group content for groups you are a member of. 5f8c59db-677d-491f-a6b8-5f174b11ec1d Group.Read.All Allows the app to list groups, and to read their properties and all group memberships on your behalf. Also allows the app to read calendar, conversations, files, and other group content for all groups you can access. 204e0828-b5ca-4ad8-b9f3-f32a958e7cc4 User.ReadWrite.All Allows the app to read and write the full set of profile properties, reports, and managers of other users in your organization, on your behalf. a154be20-db9c-4678-8ab7-66f6cc099a59 User.Read.All Allows the app to read the full set of profile properties, reports, and managers of other users in your organization, on your behalf. b340eb25-3456-403f-be2f-af7a0d370277 User.ReadBasic.All Allows the app to read a basic set of profile properties of other users in your organization on your behalf. Includes display name, first and last name, email address and photo. b4e74841-8e56-480b-be8b-910348b18b4c User.ReadWrite Allows the app to read your profile, and discover your group membership, reports and manager. It also allows the app to update your profile information on your behalf. e1fe6dd8-ba31-4d61-89e7-88639da4683d User.Read Allows you to sign in to the app with your organizational account and let the app read your profile. It also allows the app to read basic company information. 7b9103a5-4610-446b-9670-80643382c1fa Mail.Read.Shared Allows the app to read mail you can access, including shared mail. 5df07973-7d5d-46ed-9847-1271055cbd51 Mail.ReadWrite.Shared Allows the app to read, update, create, and delete mail you have permission to access, including your own and shared mail. Does not allow the app to send mail on your behalf. a367ab51-6b49-43bf-a716-a1fb06d2a174 Mail.Send.Shared Allows the app to send mail as you or on-behalf of someone else. 2b9c4092-424d-4249-948d-b43879977640 Calendars.Read.Shared Allows the app to read events in all calendars that you can access, including delegate and shared calendars. 12466101-c9b8-439a-8589-dd09ee67e8e9 Calendars.ReadWrite.Shared Allows the app to read, update, create and delete events in all calendars in your organization you have permissions to access. This includes delegate and shared calendars. 242b9d9e-ed24-4d09-9a52-f43769beb9d4 Contacts.Read.Shared Allows the app to read contacts you have permissions to access, including your own and shared contacts. afb6c84b-06be-49af-80bb-8f3f77004eab Contacts.ReadWrite.Shared Allows the app to read, update, create, and delete contacts you have permissions to access, including your own and shared contacts. 88d21fd4-8e5a-4c32-b5e2-4a1c95f34f72 Tasks.Read.Shared Allows the app to read tasks you have permissions to access, including your own and shared tasks. c5ddf11b-c114-4886-8558-8a4e557cd52b Tasks.ReadWrite.Shared Allows the app to read, update, create, and delete tasks you have permissions to access, including your own and shared tasks. 89fe6a52-be36-487e-b7d8-d061c450a026 Sites.ReadWrite.All Allow the application to edit or delete documents and list items in all site collections on your behalf. 02e97553-ed7b-43d0-ab3c-f8bace0d040c Reports.Read.All Allows an app to read all service usage reports on your behalf. Services that provide usage reports include Office 365 and Azure Active Directory. 8019c312-3263-48e6-825e-2b833497195b Files.ReadWrite.AppFolder (Preview) Allows the app to read, create, update and delete files in the application's folder. 17dde5bd-8c17-420f-a486-969730c1b827 Files.ReadWrite.Selected (Preview) Allows the app to read and write files that you select. After you select a file, the app has access to the file for several hours. 5447fe39-cb82-4c1a-b977-520e67e724eb Files.Read.Selected (Preview) Allows the app to read files that you select. After you select a file, the app has access to the file for several hours. f1493658-876a-4c87-8fa7-edb559b3476a DeviceManagementConfiguration.Read.All Allows the app to read properties of Microsoft Intune-managed device configuration and device compliance policies and their assignment to groups. 0883f392-0a7a-443d-8c76-16a6d39c7b63 DeviceManagementConfiguration.ReadWrite.All Allows the app to read and write properties of Microsoft Intune-managed device configuration and device compliance policies and their assignment to groups. 4edf5f54-4666-44af-9de9-0144fb4b6e8c DeviceManagementApps.Read.All Allows the app to read the properties, group assignments and status of apps, app configurations and app protection policies managed by Microsoft Intune. 7b3f05d5-f68c-4b8d-8c59-a2ecd12f24af DeviceManagementApps.ReadWrite.All Allows the app to read and write the properties, group assignments and status of apps, app configurations and app protection policies managed by Microsoft Intune. 49f0cc30-024c-4dfd-ab3e-82e137ee5431 DeviceManagementRBAC.Read.All Allows the app to read the properties relating to the Microsoft Intune Role-Based Access Control (RBAC) settings. 0c5e8a55-87a6-4556-93ab-adc52c4d862d DeviceManagementRBAC.ReadWrite.All Allows the app to read and write the properties relating to the Microsoft Intune Role-Based Access Control (RBAC) settings. 314874da-47d6-4978-88dc-cf0d37f0bb82 DeviceManagementManagedDevices.Read.All Allows the app to read the properties of devices managed by Microsoft Intune. 44642bfe-8385-4adc-8fc6-fe3cb2c375c3 DeviceManagementManagedDevices.ReadWrite.All Allows the app to read and write the properties of devices managed by Microsoft Intune. Does not allow high impact operations such as remote wipe and password reset on the device’s owner. 3404d2bf-2b13-457e-a330-c24615765193 DeviceManagementManagedDevices.PrivilegedOperations.All Allows the app to perform remote high impact actions such as wiping the device or resetting the passcode on devices managed by Microsoft Intune. 87f447af-9fa4-4c32-9dfa-4a57a73d18ce MailboxSettings.Read Allows the app to read your mailbox settings. 63dd7cd9-b489-4adf-a28c-ac38b9a0f962 User.Invite.All Allows the app to invite guest users to the organization, on your behalf. 9d822255-d64d-4b7a-afdb-833b9a97ed02 Notes.Create Allows the app to view the titles of your OneNote notebooks and sections and to create new pages, notebooks, and sections on your behalf. ed68249d-017c-4df5-9113-e684c7f8760b Notes.ReadWrite.CreatedByApp This permission no longer has any effect. You can safely consent to it. No additional privileges will be granted to the app. 371361e4-b9e2-4a3f-8315-2a301a3b0a3d Notes.Read Allows the app to read OneNote notebooks on your behalf. 615e26af-c38a-4150-ae3e-c3b0d4cb1d6a Notes.ReadWrite Allows the app to read, share, and modify OneNote notebooks on your behalf. dfabfca6-ee36-4db2-8208-7a28381419b3 Notes.Read.All Allows the app to read all the OneNote notebooks that you have access to. 64ac0503-b4fa-45d9-b544-71a463f05da0 Notes.ReadWrite.All Allows the app to read, share, and modify all the OneNote notebooks that you have access to. 11d4cd79-5ba5-460f-803f-e22c8ab85ccd Device.Read Allows the app to see your list of devices. bac3b9c2-b516-4ef4-bd3b-c2ef73d8d804 Device.Command Allows the app to launch another app or communicate with another app on a device that you own. 818c620a-27a9-40bd-a6a5-d96f7d610b4b MailboxSettings.ReadWrite Allows the app to read, update, create, and delete your mailbox settings. 367492fc-594d-4972-a9b5-0d58c622c91c UserTimelineActivity.Write.CreatedByApp Allows the app to report your app activity information to Microsoft Timeline. 5d186531-d1bf-4f07-8cea-7c42119e1bd9 EduRoster.ReadBasic Allows the app to view minimal information about both schools and classes in your organization and education-related information about you and other users on your behalf. a4389601-22d9-4096-ac18-36a927199112 EduRoster.Read Allows the app to view information about schools and classes in your organization and education-related information about you and other users on your behalf. 359e19a6-e3fa-4d7f-bcab-d28ec592b51e EduRoster.ReadWrite Allows the app to view and modify information about schools and classes in your organization and education-related information about you and other users on your behalf. c0b0103b-c053-4b2e-9973-9f3a544ec9b8 EduAssignments.ReadBasic Allows the app to view your assignments on your behalf without seeing grades. 2ef770a1-622a-47c4-93ee-28d6adbed3a0 EduAssignments.ReadWriteBasic Allows the app to view and modify your assignments on your behalf without seeing grades. 091460c9-9c4a-49b2-81ef-1f3d852acce2 EduAssignments.Read Allows the app to view your assignments on your behalf including grades. 2f233e90-164b-4501-8bce-31af2559a2d3 EduAssignments.ReadWrite Allows the app to view and modify your assignments on your behalf including grades. 8523895c-6081-45bf-8a5d-f062a2f12c9f EduAdministration.Read Allows the app to view the state and settings of all Microsoft education apps on your behalf. 63589852-04e3-46b4-bae9-15d5b1050748 EduAdministration.ReadWrite Allows the app to manage the state and settings of all Microsoft education apps on your behalf. 662ed50a-ac44-4eef-ad86-62eed9be2a29 DeviceManagementServiceConfig.ReadWrite.All Allows the app to read and write Microsoft Intune service properties including device enrollment and third party service connection configuration. 8696daa5-bce5-4b2e-83f9-51b6defc4e1e DeviceManagementServiceConfig.Read.All Allows the app to read Microsoft Intune service properties including device enrollment and third party service connection configuration. b89f9189-71a5-4e70-b041-9887f0bc7e4a People.Read.All Allows the app to read a list of people in the order that is most relevant to you. Allows the app to read a list of people in the order that is most relevant to another user in your organization. These can include local contacts, contacts from social networking, people listed in your organization’s directory, and people from recent communications.